Password protecting a PDF file helps you ensure that even if the document gets lost the content won’t be available to anyone else unless you shared the password with them. we can apply two different types of passwords to PDF files. One is user password, and the other is owner password. These two types of password are applicable in different situations: the user password prevents others from opening (and reading) PDFs without knowing the password, while the owner password allows viewing but prevents editing, copying and printing PDFs. However, it often happens that security passwords for the documents are lost, forgotten, etc… And you cannot access your own data anymore. Of course you can spend a lot of time and effort on creating this document all over again, or you can save your precious time and use Eltima Recover PDF Password – the software developed specifically for such cases that will help you retrieve both “Owner” and “User” passwords, even if you cannot remember a single character from the key combination. 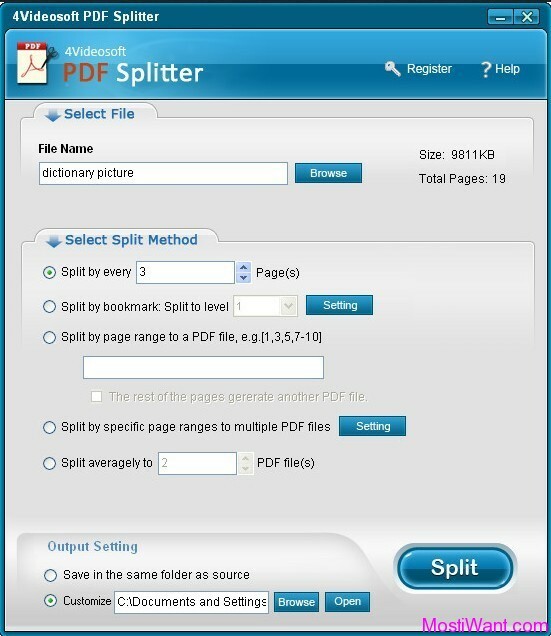 It can also be useful if your administrator is out of reach and you need to unlock your own pdf files. And it doesn’t matter how long ago your PDF document was protected with a password – Recover PDF Password is compatible with all versions of Adobe Acrobat up to v.9 and third-party PDFs, and supports recovery of Unicode passwords uncluding Acrobat 9.x files. You won’t experience any issues in the PDF password recovery no matter what language or keyboard layout it was created in. Get an unprotected copy of PDF file without password search. Dictionary search through the passwords. 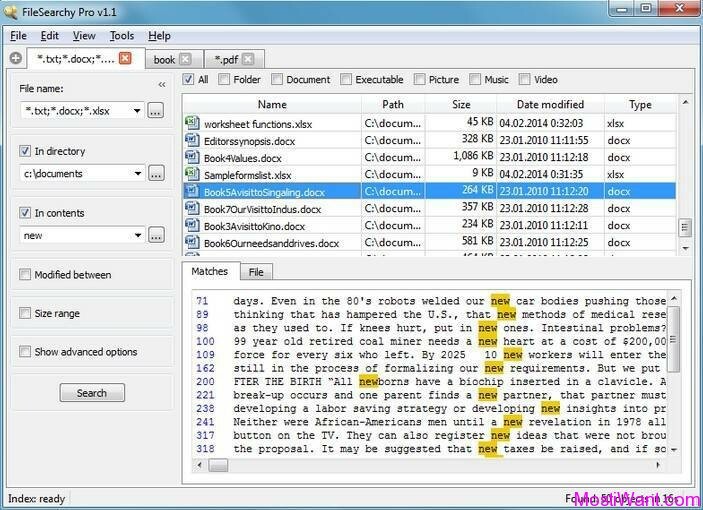 Recover PDF Password offers the dictionary that contains more than 400 000 words. View already recovered PDF file passwords -“History” tab lets you view already recovered PDF file passwords at any time. Moreover, you can delete one or all entries in “History” by clicking “Remove” or “Remove All” buttons, copy “owner” or “user” passwords and view date and time when the selected password has been recovered. Take note that “recovery” of passwords is different than “decryption” of the file. Recovery involves finding the actual password; after a password recovery, the PDF is still Password protected; while Decryption of the PDF involves removing the actual encryption so all password protection and permission limitations will be removed. “Decrypt” option is a very convenient thing. Say, your PDF document was protected with “owner” password only and you don’t want to spend time recollecting this password or searching for it. Good news: your file can be decrypted right away with Recover PDF Password. Just add your PDF to the application and press “Decrypt” button. The next thing you’ll have is your unprotected and totally unrestricted PDF file. However, in case your document was protected with “user” password, you will need to first recover the password with Recover PDF Password for Windows and after that decrypt the document to use it with no limitations at all. Recovers “owner” passwords, which protect documents from being printed, copied or edited. Specify your own template to minimize search time if any part of the password is known – include or exclude digits, lowercase or uppercase letters, etc. Creates the decrypted copy of the file if “user” password is known. Learn more about Eltima Recover PDF Password. Eltima Recover PDF Password is normally priced at $39.95 per serial number / registration code. But SharewareOnSale (SOS) are having a giveaway of Eltima Recover PDF Password, where everyone can download a full version copy for free. The giveaway will be valid for today only (24 hours on October 4, 2013). Don’t miss it. Visit Promo Page. Old MostiWant Giveaway – Expired Now. 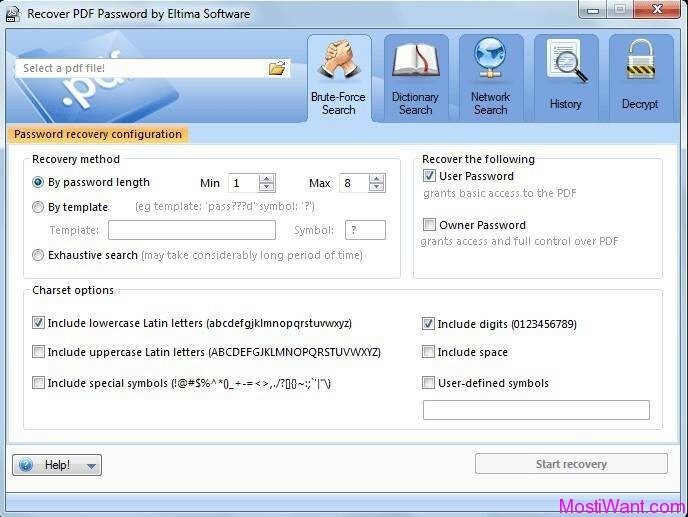 In cooperation with Eltima Software (developer of Eltima Recover PDF Password and sponsor of this giveaway), we can offer 3 serial number / registration code to activate the Full Version of Eltima Recover PDF Password 3.0 for windows, each worth USD 39.95. To win a free serial number / registration code, simply leave a comment below to register for the contest. A valid email address must be entered on the “Mail” field. And do NOT post email address inside comments to avoid spam. The Giveaway will end on 17th Aug. 2011, 12:00 PM GMT. Winners will be selected randomly, and will be announced before 20th Aug.2011. @shrikant , sorry but this giveaway has been closed. thx for the grat work, this will very handy to have it. I wanna win. I wanna win ,i wanna win, i wanna win. This would be a very handy app to have. Thanks for the opportunity.!! Thank you.I wanna win this goody. Very good and useful software. Thanks for this giveaway. Hope I’m not late for the giveaway. Thank you for the giveaway, would to love win one license too. Appreciate if you can count me in for the drawing of Eltima PDF password recovery.A handy tool indeed. 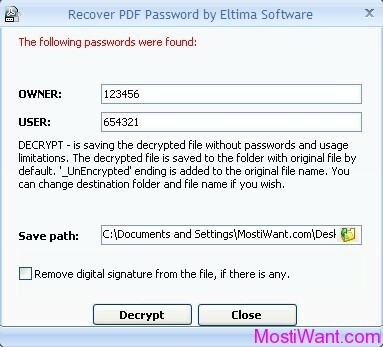 Nice giveaway.Eltima Recover PDF Password is very nice software for recovering passwords. i like Eltima software. Very talented programmers who truly love their work. Thanks Mostiwant and Eltima software for this nice giveaway!